Onions have been on my mind lately because I have been sorting my harvest. I make sure to harvest onions when their tops begin to fall over, but while the tops are still green. Each leaf is a covering over the onion, which protects it. When the tops dry, the outer covering can be removed to reveal a clean onion. Trim the roots and that is all there is to cleaning onions. Before you can get to the cleaning part, you need to have a good way to dry the onions with their tops intact. If you do that, you can braid them. When you leave the onions in the garden for too long, the tops die and disappear. Not only do you not have the tops for braiding, but you may not even be able to find where the onions are. A shady place is good to dry onions, and if you don’t have too many you could spread them out on your porch to dry. 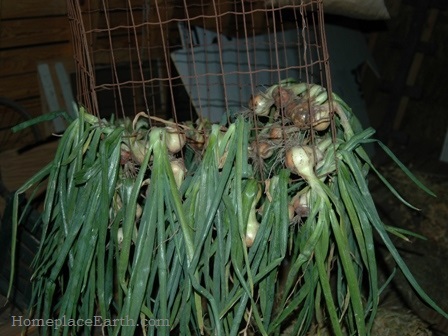 When I was growing a lot of onions to sell I would spread them out on the floor of our barn loft. In June and July it was available space, but in August I would be getting in hay for the cow that we had at the time, so I needed to sort and braid the onions in a timely manner. Onions hung to dry after harvest. Eventually I needed to come up with a better way. I decided to use some old welded wire fencing with 2”x 4” spaces. I made the fence into a circle and put it on two cement blocks for better air circulation. 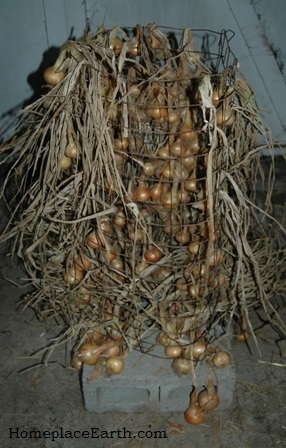 The onions are loaded onto the fencing with the bulbs in the middle of the circle and the tops on the outside. If the onions are too big to be put through the spaces from the outside, you need to reach the onion down to the inside and pull the top through to the outside. Keep that in mind if you are making such a circle. A good size is about 3’ high and 2’ wide. Onions dried on this circle of fencing. Having this rest on the cement blocks works for good air circulation, but I’ve also hung it up by tying baling twine to two sides with loops to hang from nails in the rafters. This frees up floor space in addition to contributing to better air circulation. Once the tops are dry (it will take a few weeks) you can begin to sort. There is no hurry and you could leave them there for quite some time, but it is best to go through them to determine the ones that will keep the longest and the onions that need to be used soon. I grow storage varieties because I want them to last as long as possible. Some of the sweeter varieties are not for storage and you will need to eat them or dry them soon. Even with the storage varieties, there are always some that need to be used before too long. I determine that by pressing with my thumb where the dry top comes out of the onion bulb. If there is no give, it is a keeper. If there is just a little give, those are the next best keepers. If I detect a softness there, I put those aside to use first. I would use the onions that I knew were not long term keepers in cooking throughout the summer and in the spaghetti sauce I used to can. 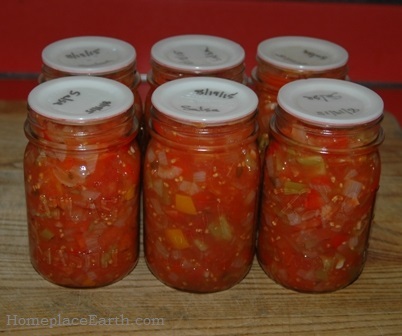 Now that I make spaghetti sauce from my solar dried tomatoes, I dry those “use first” onions in my solar food dryers for use later in the sauce. Preparation for that is easy—cut them up and put them on the trays. My solar dehydrators are outside, of course. If you are drying onions in an electric dryer be prepared for the aroma of onions. You might want to set the dehydrator out on your porch when you are doing onions. String for braiding is attached. I love braiding the onions that I will be keeping the longest. They will hang in the rafters of my garden shed until fall. Then I will hang the braids from the floor joists in the crawl space of our house, bringing one braid at a time to the kitchen. I usually put about 3 pounds of onions in each braid, although the string of red onions in the photo below only weights 1.25 pounds. To make a braid, I cut a string about 3’ in length, fold it in half to make a loop, and wrap it around one onion top near the bulb. Drawing the two ends of the string through the loop holds the string tight to the onion. 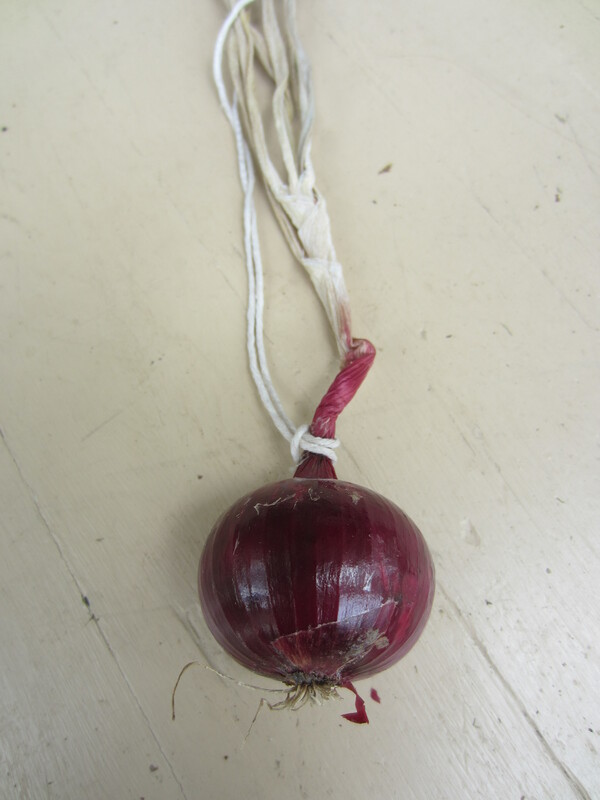 The string is braided along with the onion top it is attached to. You need three onions to start the braid. To braid, keep putting one onion top to the middle working from one side, then the next. Add a new onion each time a dried top goes into the middle. The top for that onion will now be braided with the onion top it was paired with in the middle. It is time to tie things off before you run out of string. There should be two string ends mixed in with your onion tops. I wrap them around the dried tops a couple times, knotting them in the front and the back. Tie the ends together, leaving a loop for hanging. Trim the tops to an attractive length. For a great looking onion braid, pull off the dry outer covering and trim the roots on the onions before braiding. Braids are great. Not only do they look good, but you can see all the onions at once, making it easy to choose what size you want. If one is not looking so good, you will know right away and can use that one before the others. If you are selling onions at a farmers market, the braids hanging from your canopy will attract attention and you can get a premium for them. 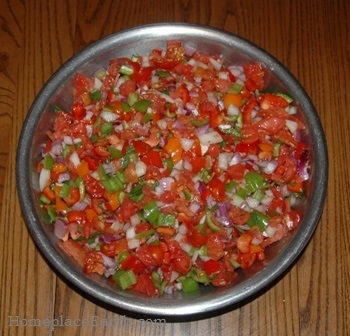 You can even mix varieties, and if you look closely at the photo of the braid, you will notice a yellow onion in with the red. 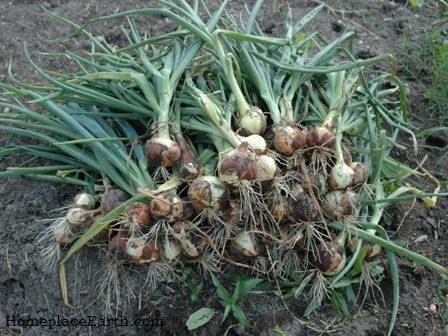 If you have harvested onions this year and wondered just how to handle them, I hope this post has given you some good ideas. You might want to make some notes for next year’s harvest. 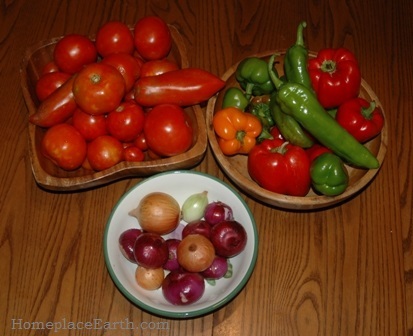 In a previous post about onions I wrote of the health benefits of onions and gave some planting tips. They should be part of everyone’s diet and garden. If you did not grow any onions this year, buy them from local growers now and plan to make onions a part of your 2016 garden plan.